This table is trying to balance an emphasis on structural detail, subtle shaping and form, and use of beautiful natural materials to create a visually light overall design. All of the joinery in the table uses wenge wood splines locked in place by brass pins. The top is made of a highly figured African mahogany wood that rests about ½ inches above the upper rail giving it a floating affect. 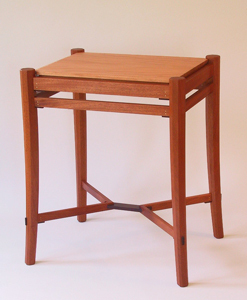 The legs are eight sided, curving out and tapering inward to create a smaller profile at the foot while maintaining the facets of the shape that is defined from the top view of each leg. The lower stretchers are connected using a larger wenge wood spline in the center.